Can the Neck Be Exfoliated? Use household baking soda to brighten your smile. 2 Can the Neck Be Exfoliated? 4 How Do I Curdle Soy Milk With Lemon Juice? 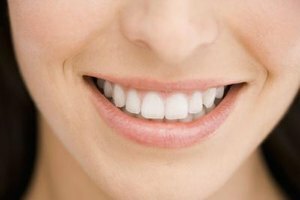 If improving your smile is on your to-do list, consider teeth whitening. Head to the kitchen pantry for a few basic ingredients and tools to naturally whiten your teeth at home. There's no need for expensive whitening treatments at the dentist's office. You can get your teeth whiter in 10 minutes a week by following a daily teeth-cleansing routine after your morning brush with toothpaste and use of dental floss. Place 1/2 cup of baking soda into a small sealable glass food-storage container. Add a few drops of cold water to the baking soda. Use a spoon to stir the mixture into a paste consistency. Use more water if needed. Dip the tip of your toothbrush into the homemade teeth-whitening paste. Seal the container and save the rest of the paste for subsequent brushings. Brush your teeth with the baking soda paste for approximately a minute and a half. Focus on all surfaces, including hard-to-reach molars. Rinse your mouth with a glass of cold water. Swish and spit into the bathroom sink. Make teeth whiter faster by brushing with baking soda paste twice a day and avoiding teeth-staining beverages such as coffee and fruit juices. Don't swallowing the baking soda paste as it may cause digestive upset. Men's Health: Do Home Whitening Kits Work?